Gigaset SL400: This is a compact powerhouse in a noble guise. 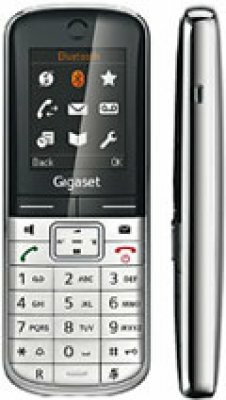 The Gigaset SL400 is winner of the "product design award 2010" and was rated "very good" by the renowned magazine "connect". The many extras such as luxurious material, metal keyboard with lighting, large display, intuitive user interface, Bluetooth and headset connection, ECO DECT, generous address book, expert mode, Picture-CLIP and low energy consumption, no wonder. Beim Gigaset SL400 müssen Sie nicht erst lange komplizierte Bedienungsanleitungen studieren. Mithilfe der intuitiven Benutzerführung kommen Sie immer schnell an Ihr Ziel. Das beleuchtete Metall-Display macht die Eingaben ebenfalls leichter und das 1,8 Zoll große Farbdisplay hat eine genügend hohe Auflösung, dass Lesen und Navigieren zu einem wahren Kinderspiel werden – auch dann, wenn die Lichtverhältnisse mal nicht optimal sind. Wenn Sie Ihre regelmäßig genutzten Funktionen immer griffbereit haben wollen, stellen Sie doch einfach den Expertenmodus ein. So haben Sie die für Sie wichtigen Funktionen immer im Blick. You do not want a phone like the others, but a personal touch? Again, the Gigaset SL400 has just the right function for you. With Bluetooth and Mini-USB, you can easily and quickly upload your very own personal photos for the screen saver or a slideshow. And if you associate the corresponding pictures in the phone book with a name or a phone number, then the picture appears on the display as soon as the person calls. Faster you can not see who is waiting at the other end of the line. See on telefon24.de yourself how individually you can design the Gigaset SL400! Das SL400 verfügt über keinen Anrufbeantworter. Falls Sie das Gerät mit Anrufbeantworter benötigen, lautet die Bezeichnung "SL400A".